If you’ve been around here long, you know that I love flowers and I love food (specifically of the sugary variety). 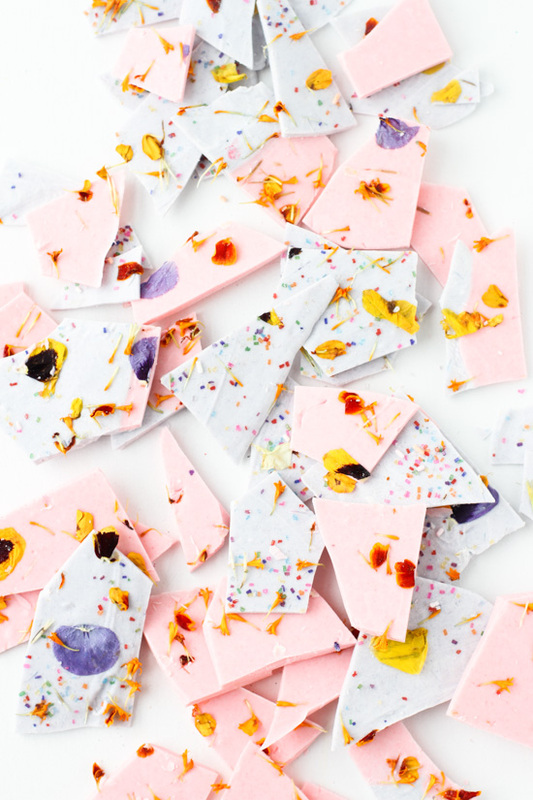 So, I thought I would combine the two in a colorful DIY recipe that is oh so sweet. You game? 1. Melt the chocolate according to the directions on the packaging, either on the stovetop or microwave. 2. Separate the melted chocolate into 2 containers and add gel food coloring to each one. I chose violet and pink for my colors. 3. Then, pour the melted chocolate onto a sheet pan that has been covered with wax paper. Keep the half of the pan one color and the other half the second color to get a color blocked look. Smooth with a flat spatula, if needed. 4. 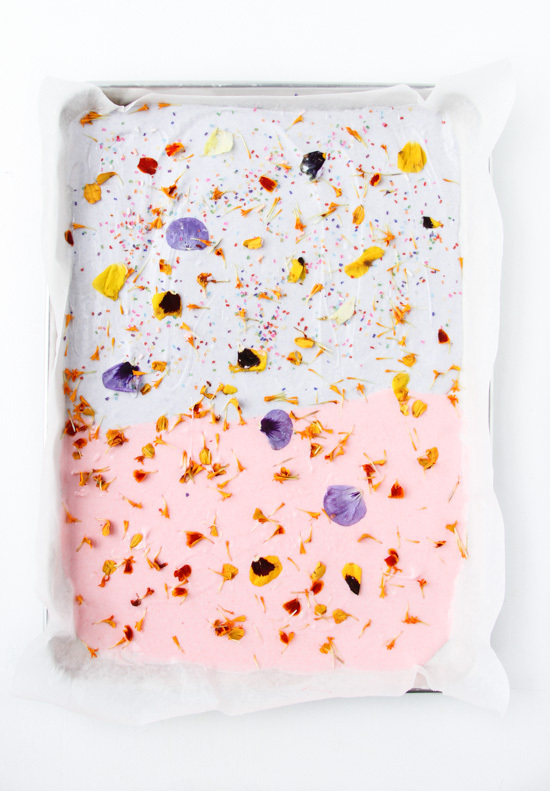 Next, remove the petals from your edible flowers. And while the chocolate is still in a liquid state on the pan, sprinkle the flower petals over the top of the chocolate. 5. 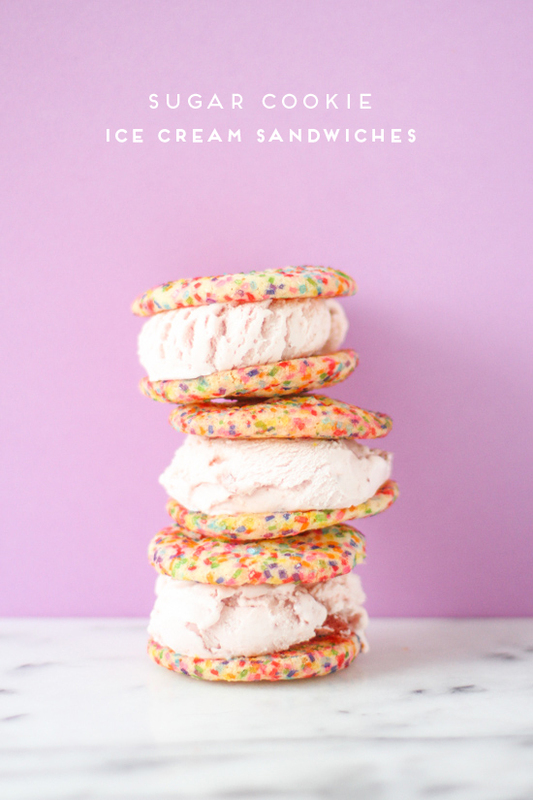 Add colorful sprinkles as well, if desired. 6. Then wait for the chocolate to harden completely. You can speed this process up by putting the pan into the fridge. 7. Once the chocolate is completely hardened, use the back of a wooden spoon to break the chocolate up into pieces of bark, as shown in the photos. 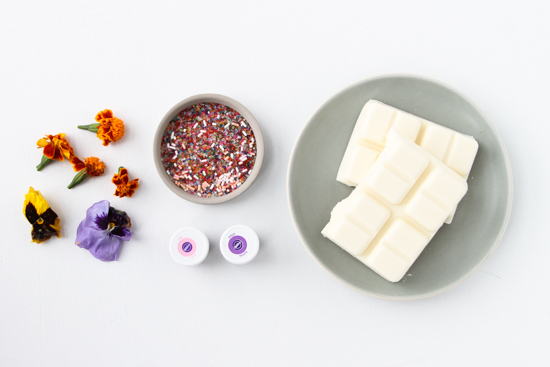 Have you ever tried using edible flowers for food projects? Aren’t they fun to work with? 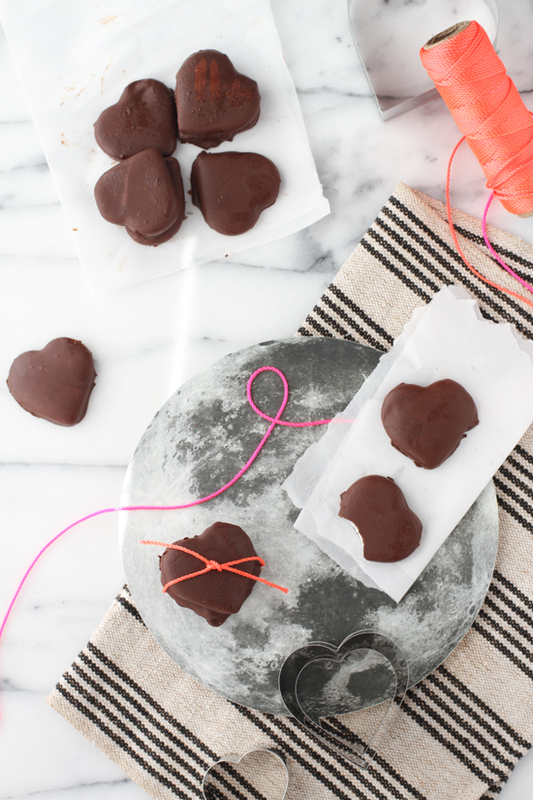 For more sweet treats and recipes like this one, visit the food + recipes tag. This looks really amazing! Pinning to try for later! Gorgeous, Brittni! 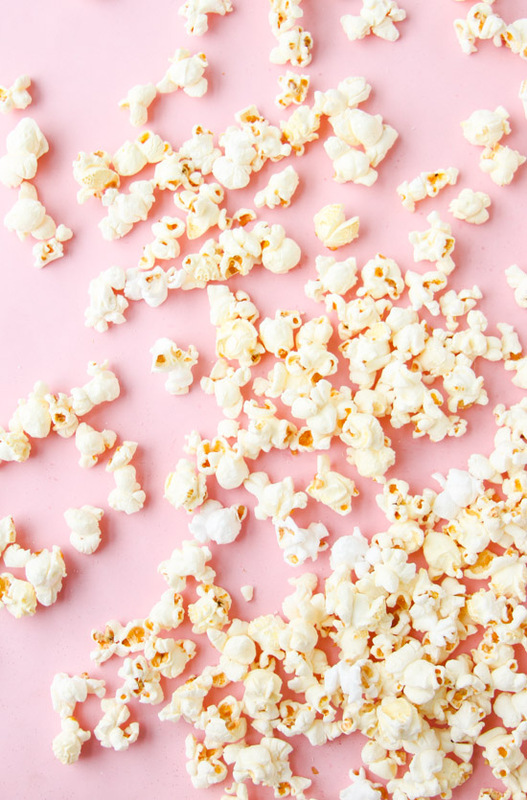 You always have the best food DIY projects! 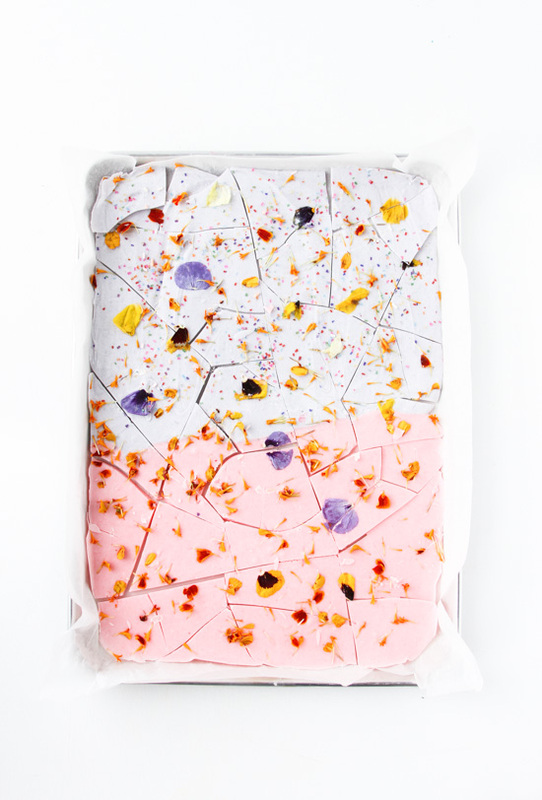 So-this is spring all wrapped up in what looks like a delicious a block of awesome! I love it. I would have never thought of using flowers to “decorate” a chocolate bar. Sadly, I will probably never get around to making it. It’s going on a “things to try” list anyway. Im obsessed with this, B!! I can’t even handle how pretty this is. I’d have a hard time eating it! Wow. 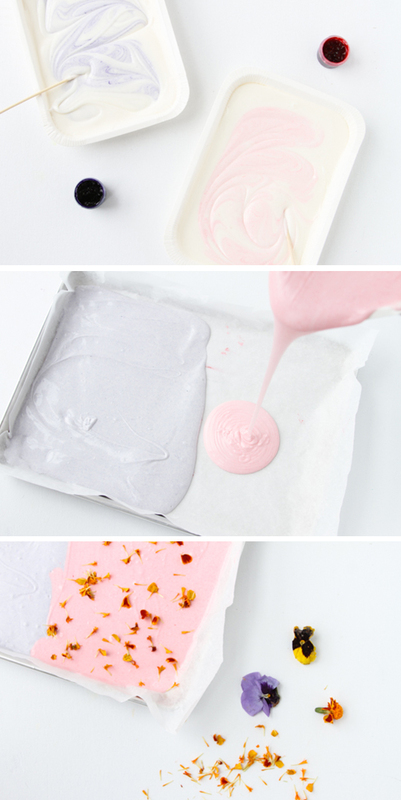 This is one of the most beautiful DIYs I’ve ever seen! I don’t think I could love a bar of chocolate more! This is so beautiful! It’s like artwork! This is just such a good idea, I am just wondering if my attempt will be half as good! This. Is. Un. Real. You’ve outdone yourself B! It’s just too beautiful to eat! It looks so easy to create and will certainly impress. What an amazing idea!!! I will definitely use this at Christmas time as edible gifts for friends… and I’m also thinking it would be a gorgeous treat at a baby shower! How much white chocolate do you use for this recipe? Are you using “almond bark” or “white chocolate”? Hi Kathy. You can use white chocolate chips or Candiquik. Hope that helps. Did this and loved it!! I had to melt a bit more chocolate than I thought I would need but this turned out really well. I also just used plain white melting chocolate and it seemed not to make a difference in the final product. A brilliant centre piece. So glad to hear it turned out well, Isla! 8 Chic Wedding Ideas For 2016 – Kennemere & Co.
Hi! May I know if you used edible preserved flowers or fresh flowers? If you used fresh, are they going to stay this way? How far in advance can you make? Do the flowers wilt or brown? This is really beautiful**as someone who grows edible flowers I use them often in salads & to garnish cakes but I preserve mine so my question is: Are these intended to be eaten the same day because they will lose their color rapidly otherwise ??❤️? Hi Candy, Kat and Jody. 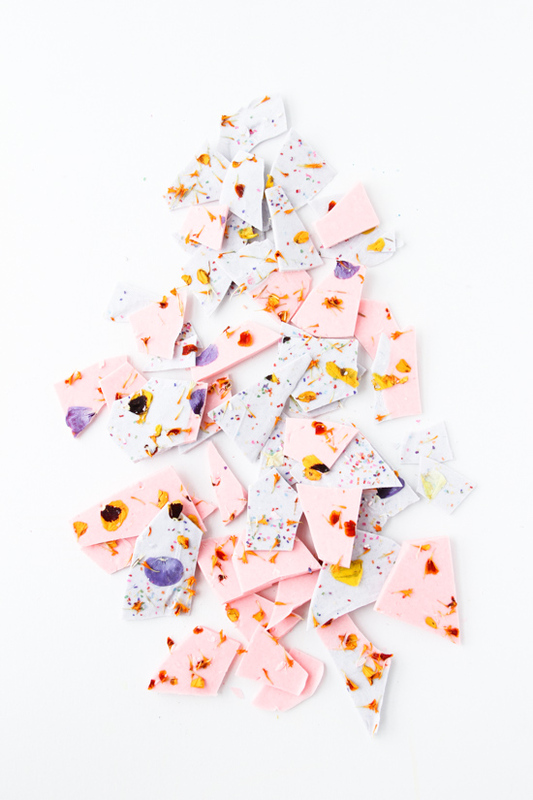 Yes, its best to eat the bark the same day, if using the edible flowers. It’s so easy to make though, you could make it right before an event and get together without feeling rushed. Hope that helps. I’ve only seen bark done for the holidays using milk or dark chocolate. Its interesting to see this new twist on holiday bark! Oh my! This looks SO good! What’s the recipe to make this? Hi Alesha. The recipe is outlined in the content of the post. Best! How much chocolate do I need to buy to make a tray of this? Thanks. Hi Malinda. I used 16 oz of chocolate for what you see in the photos. It just depends on how much bark you’d like to make. This is such a good idea! SO beautiful! Hi,i would like to do that as wedding favors, does anyone have any experience on how long they last and if you can keep them out of the fridge?